it's not trolling. If we started with Keita and not Firmino we'd have won that game comfortably. We won with the last kick of the game, that's luck and we won't get luck every game. We have Napoli coming. I'm delighted we won but we need to start putting teams to the sword. I'm getting bit nervous for what fa will do to Jürgen. Still didn't agree with the subs but Klopp has all the info and still has massive credibility so I'll say it was a master stroke bringing on Origi. Origi will dine out on that in Liverpool for the rest of his natch..
What an amazingly bizarre and brilliant match winning goal ! Couldn't celebrate for a moment as it just felt like it would be ruled out.. but when the goal stood.. lift off !! Ball didn't go out of play, so it was correctly given too. Absolutely fantastic!! Them cu*ts are as bitter as the f**king pundits mate,No need for me to get up handy to get me paper tomorrow as there be no f**king bluenoses buying them. Oh yes, and we were denied a certain penalty from Sturridge's shot too so.. justice!! How did we do that? 95th min winner from Origi. Jürgen seems to have pulled a magic sword from his arse. We need to do better, regardless of the result. We are competing with City. "What a bummer.how much to I hate the Red Sh*te I f**king loath the red bas**rds with a passion.iI would love their their Stadium to be burnt to f**k horrible lucky bas**rds"
What has the discipline been in the past? Ha ha! Danny Mills RAGING about Klopp's celebration! Hope he has a f**king stroke live on air over it. So did Jürgen go on the pitch when we scored, or at the final whistle ? Lot of fuss being made ! Fair enough.Plenty wanted Keita to start, me included. And yes we do need to finish better. But we're not in that bad a shape. Mo will get the rub sooner or later. Pickford...it was actually going out, so it was poor by the lad. 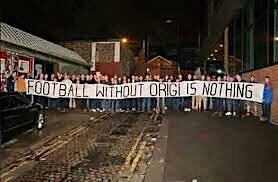 Quick thinking by Origi following in. Exactly. This win was AWESOME, but don't lose perspective here. We are in a mini-crisis. F***ing hell! Don't think Anfield's had a more mental moment this decade! Surreal! For celebrating on the pitch, while the game is still on. I can remember the last time it happened. I can see some match bans and a fine. Nobody gives a Shiny Sh*te how we played, We Got 3 f***in points and WON !! Favourite Derby game ever. Outstanding. That goal is gonna replay in my mind until the day I die. VVD on the interviews, he’s the coolest guy in the f**king world isn’t he?